This morning I was not sure what I would write about in my daily Secret, so I did my usual Twitter cruising. I find sitting with my laptop, meeting new followers, and discovering a few new interesting people to be an excellent way to make the transition from sleep to wakefulness. So, as soon as my morning meditation is over, I dive into the alternative realm of Twitter. I can honestly say I love this time. It is so fun to meet new people in all parts of the world, to rejoice in our similarities, and to learn from our differences. And I realized that I had found this morning’s secret. You may be able to read the picture above, but I am going to reprint what it says anyway. I will not attempt to recreate the graphical display, but the words are what I find so insightful. Some opportunities only come once. Seek them. I am not sure who the original author was, but I found it here. I love this. It would be great fun to hold this sign on a busy street and see how many people would allow for the time to stop, read, and consider the wisdom contained here. I am thankful for reminders, like this, which I seem to find everywhere I look. I am thankful for Twitter. It is such a fun place to share our hopes and dreams. Finally, I am thankful for all the beautiful expressions of Light and Love which populate Twitter, Facebook, and any other venue where people gather to share what is important to them. Together we make life infinitely more fun. Your site is so inspirational. i want to buy the print this is your life. Where?? Hi Maggie, I honestly do not know where one could purchase this print. I saw it on another website and shared it here. Sorry I can not help. I’m a girl from Shanghai,and i happened to see this.I just want to express my gratitude. Thank you for taking the time to leave a note. Please accept my gratitude and love. 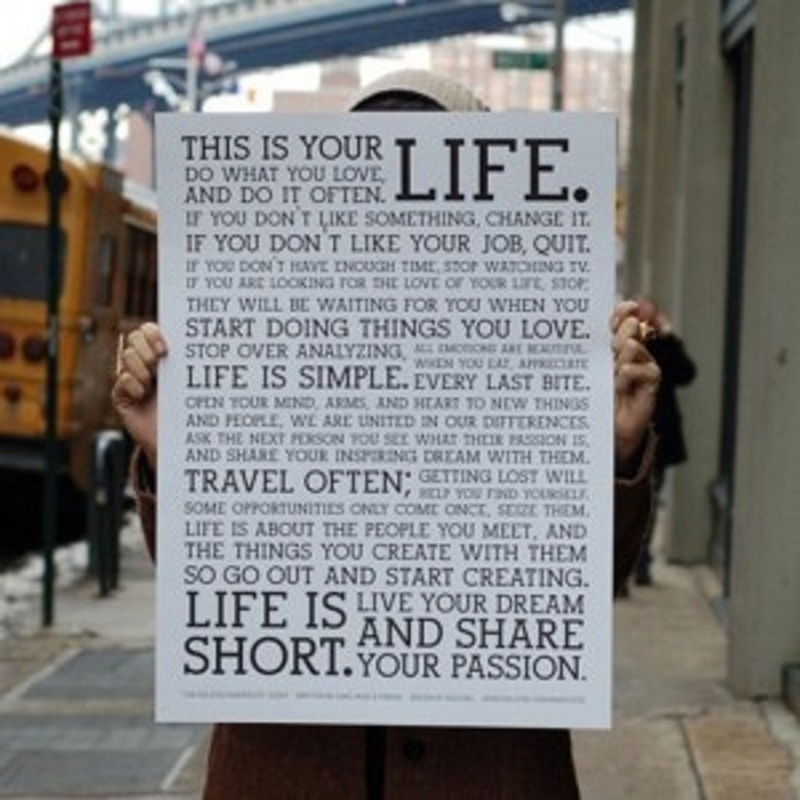 This poster really spoke to me when I saw it in the summer of 2011, much more than any other motivational poster-ever. I stared at it for a month, quit my job without a job in hand (unemployed for the first time in 23 years), and have never looked back. In fact, my life has only gotten exponentially better since then. There isn’t a single thing on here that does not inspire me to do better, be better, live better.